Please enjoy Katelyn Emerson playing Widor’s Toccata on this marvelous organ! 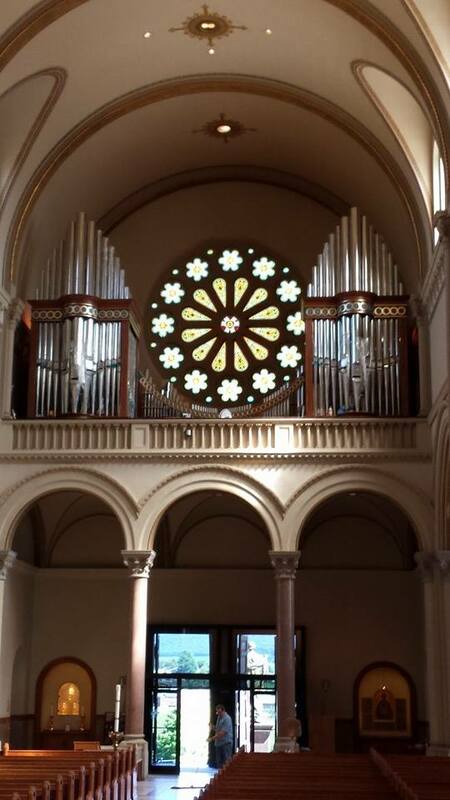 The new Gallery Organ at Saint Vincent’s of 51 stops and 72 ranks of pipes was installed beginning in July, 2014 and completed in October, having spent the previous year and a half in construction. 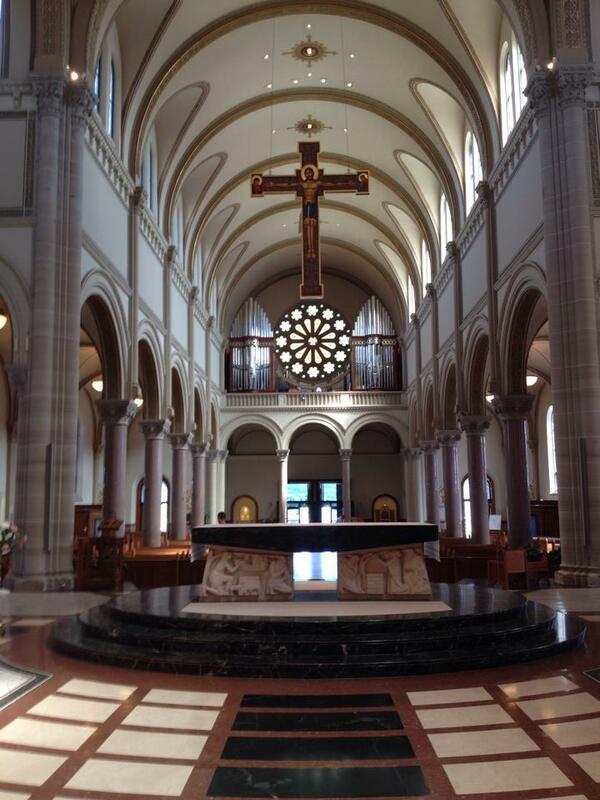 The Basilica is home to Saint Vincent Archabbey, the oldest American Benedictine Monastic Community, Saint Vincent Parish, Saint Vincent College, a four year co-educational institution, and Saint Vincent Seminary. Choir Division of 13 stops prepared for future addition. Manual II, Unenclosed. Large pipes in the case’s façade. The Apse division is divided into two divisions (red and black), two chambers with each having their own Swell boxes. They can be coupled individually to each manual. 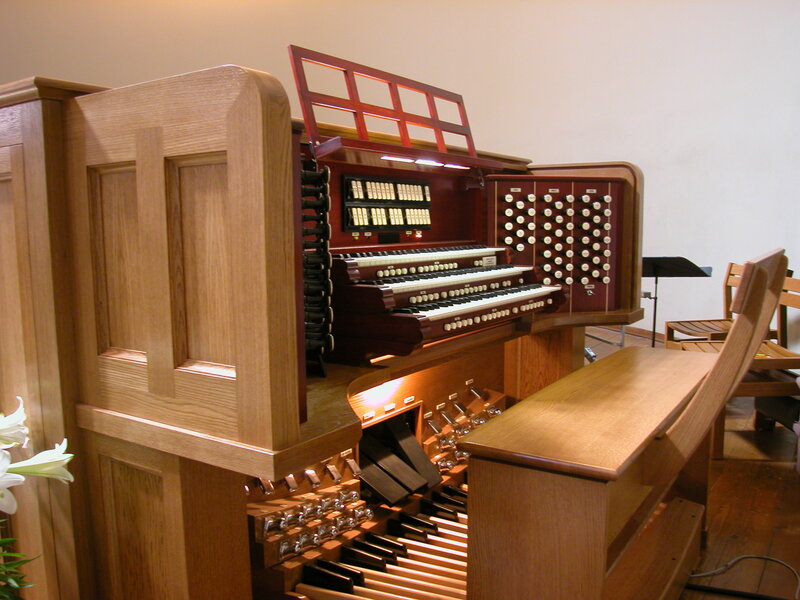 Please note: The organ has a set of full inter and intra-divisional couplers at 16’, 8’ and 4’ pitches. These are omitted from the stoplist for ease of reading the speaking stops. Nearly 20 years ago, I was asked to provide consultory services to address the mechanically failing organ previously installed in the Basilica. Its greatest intrinsic flaw was that it was tonally only about 30% as large as is required to fill this large building with a wide palette of tone colors at a variety of volume levels. My report provided a preliminary specification and a budget. The project stalled for 18 years until 2007 when we were asked to construct a small organ in the Apse to accompany monastic services in the Choir, which had been a part of our overall master plan. As a part of this project we included a console which would control both it and the planned-for Gallery Organ. When the Gallery Organ project moved forward, the 18 year-old budget was insufficient and could not be increased. 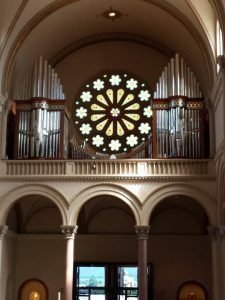 We had a dilemma: if we built an organ to accommodate an inadequate budget, it would repeat the past mistake of being too small for the Basilica’s heroic size and its musical requirements. So, we decided to build an organ with the infra-structure of a complete instrument, but preparing the Choir Division for future addition. 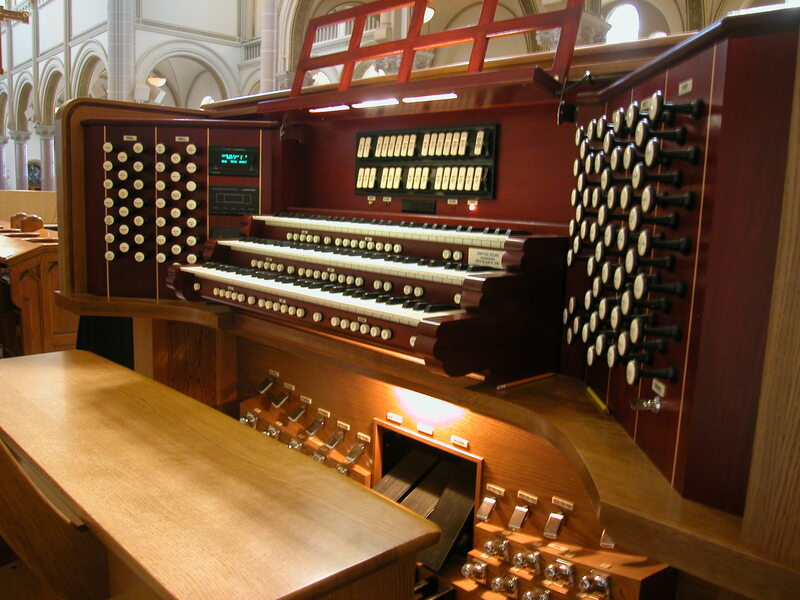 This would provide the Abbey with heroic bodies of sound to support the liturgical needs, and accommodate a good body of the solo organ literature. The prepared-for Choir Division will include a wide variety of softer orchestral reed flue colors for more registrationally intricate choral accompaniments, and to act as a secondary foil to the Great for playing solo literature requiring three independent manual divisions. Architecturally, the Gallery posed a challenge: The Gallery is not large, nor is the wheel window located high enough up on the wall to allow a generous configuration of pipes and their mechanical systems to live under it. Additionally we were told that the organ must be located entirely in the Gallery with no pipes over the rail. After reviewing the many drawings I had made during past years, The Rev. Vincent Crosby OSB, the Abbey’s resident Artistic Director, suggested that he simply wanted to see pipes in the Gallery, with only the amount of casework necessary to support them. This general direction and a very rough sketch was the genesis for the visual design you see. The Great Division is split into two windchests located just behind the front of each of the large façade pipe groupings. The Swell is located on the right side; the prepared-for Choir Division will be on the left. The 32’ and 16’ Pedal Trombone resonators and the 16’ Double Open Diapason basses are made of wood so that they can lie down under the window, with the remaining Pedal stops, the Solo Tubas and Trombas standing vertically under and around the window. The façade pipes are all made of copper lined polished tin and are comprised of the Pedal 16’ First Open Diapason, the continuation of the Great 16’ Double Open Diapason from the wood basses behind, the Pedal 8’ Principal and the Great 8’ First and Second Open Diapasons. The smaller façade pipes in the central display are from the Pedal 4’ Open Flute. The decorations on the cases’ woodworking take their cues from the painted decorations in the colonnades in the Basilica. Although the lower portion of the case cannot be seen from the main floor, being blocked by the solid balcony rail, it is made of 1 ½” thick solid white oak, incorporating Romanesque arches in each panel opening, stained and finished to match the other woodworking in the Basilica. John-Paul Buzard’s “Classically Symphonic” tonal style (a term coined by a Diapason Magazine reviewer) is easy to describe, but difficult to carry out successfully. Buzard organs intend to play music from every historical and nationalistic school with musical éclat and flair. The difficulty in achieving success in this style is to create an instrument that plays most everything, yet has its own singular and individual artistic character. 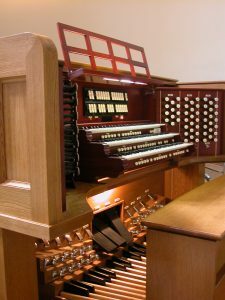 Because we are living in the 21st Century with so much musical history behind us which we want to recall, I believe that our liturgical and concert organs need to be able to play everything. 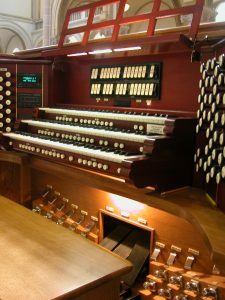 Therefore, every historic and nationalistic style of organbuilding is represented to some degree in each Buzard Organ, but interspersed through the instrument evenly so that a balanced eclecticism is achieved. We don’t create this by building entire divisions of the organ in single styles as many do: (a German Great, a French Swell, an English Choir for example). The reason that we could in good conscience prepare the Choir Division for the future is because of this even-handed dispersion of the style of the stops’ construction and voicing. When the Choir Division is installed, then this instrument will be a complete artistic achievement. Although this organ is currently very fine and impressive sounding, I liken it to a tapestry which is missing a color or two of embroidery. Coupled with a sumptuous acoustic, this allowed us to achieve the effect that, depending upon the piece of music played, you can easily imagine yourself in Paris, Haarlem, or York Minster!